Richard Keys and Andy Gray will broadcast their new weekly show on talkSPORT live from Doha in Qatar. The sports presenters this week confirmed that they have presented their last daily show for the station and will move to a new Friday night slot. Media reports have suggested that Keys and Gray, who were forced out of Sky Sports in 2011 after a sexist scandal involving assistant referee Sian Massey, will be resurrecting their television careers with Al Jazeera's English language channel. And while there has been no confirmation yet from either the pair or Al Jazeera, a spokesperson for talkSPORT owner UTV Media confirmed to Prolific North that they had been told that Keys and Gray would be presenting the Friday preview show from Doha. Warrington-based UTV Media were unable to confirm whether the pair would also be hosting live football commentaries for talkSPORT from Doha. Speaking of the move to a weekly slot, Richard Keys said: “The anticipation of a full weekend of football is one of the most exciting things in sports broadcasting. He later added on Twitter: "Wouldn't and couldn't 'walk out' on TS. I owe them too much. Best work place I've ever been in. Doesn't try to be something it isn't. Back in August with a new Friday evening show. Going to be concentrating on tv work going forward. TS feels like family. That won't change." 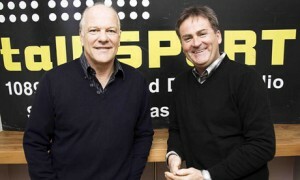 Since joining the station in 2011, the pair's mid-morning show has twice been nominated for Sony Radio Academy Best Sports Programme, winning the Gold award in 2012.